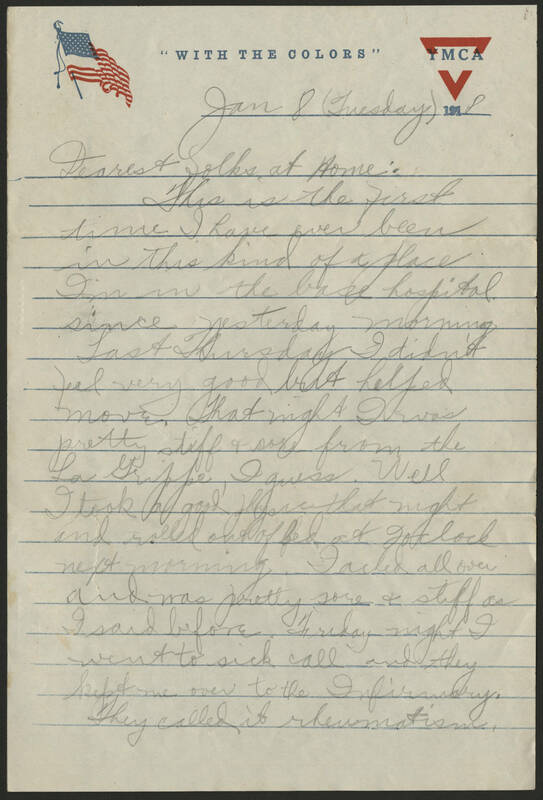 Jan. 8 ( Tuesday) 1918 Dearest Folks at home: This is the first time I have ever been in this kind of a place I'm in the base hospital since yesterday morning. Last Thursday I didn't feel very good but helped move. That night I was pretty stiff & sore from the La Grippe, I guess. Well I took a good physic that night and rolled out of bed at 2 oclock next morning. I ached all over and was pretty sore & stiff as I said before. Friday night I went to sick call and they brought me to the infirmary. They called it rheumatism.